That m31, could use the HDR mode, I'd imaging Orion could too. I hope they will add it to sharpcap. I am a dilletante on sensors but I imagine the HDR mode, a non-linear stack mode and 63k well depth could be a total game changer with the right software? Like Hiten i so love my SX camera and SLL. Between SX not releasing new CMOS cameras and Paul being awol for a very long time on SLL, it is time to move forward. 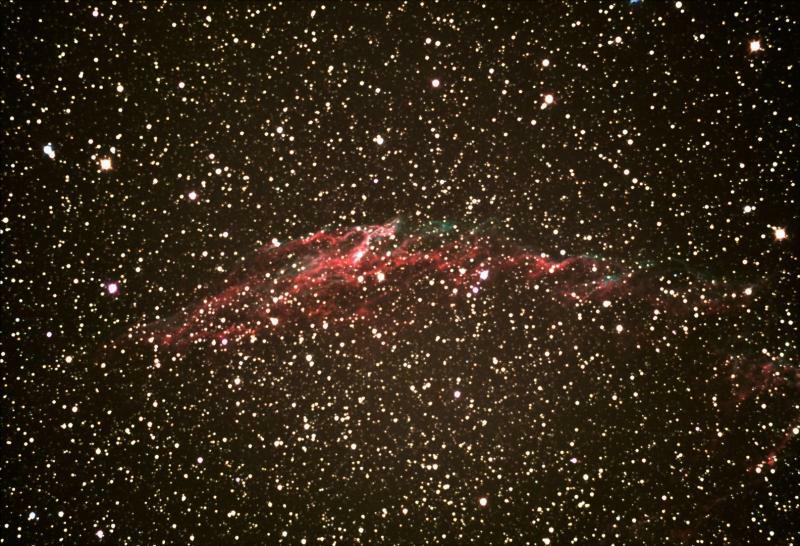 You may be right, Brandon, but your results posted in Oct Objects of the Month were superb with your SX825, as was Martin Meredith’s with his Lodestar. Yes, both Brandon and Martin's results were excellent and I would love to see the results they get with these newer sensors from their relatively darker skies vs. the white LP zone muck I live in. Edited by Astrojedi, 18 October 2017 - 09:27 PM. I was looking at an ASI071 for just some normal grab and go imaging, but this ASI294 looks real nice too. Got me wondering if it might be a better choice. How to deal with Pixinsight ?? This is not the forum for Pixinsight questions as it is still is not (from what I understand) supportive of EAA observing. You might want to post the question in one of the AP forums. For EAA the 4x4 matrix is great. Note that the sensor was designed for higher resolution security low light work, which has needs very similar to EAA observing. Beside the size of the sensor (APS-C vs 4/3") I didn't find any big advantage of the ASI071 compared to ASI294. Received the tracking # from ZWO and it is scheduled for delivery Friday. That is pretty amazing, all the way from Shanghai to TN in one day. Partly cloudy skies forecast for Friday night, then it may be Wed before another opportunity. Where can I find out more about the pixel array? I have the same question, but I’ll ask on more on another board. I'd like an image capture software that does NRTV while I'm capturing normal subs! Like, does image calibration (as much as it can), alignment and integration continuously over the hours that I'm collecting data. 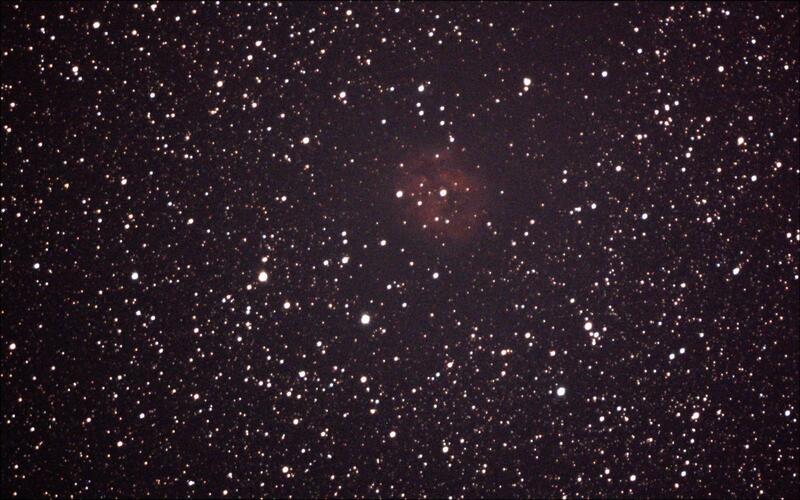 Once data collection is done, I already have my image (and the original data for better processing later). Best, I can watch it improve as it captures data. Yes, I know it's not so simple, but one can dream. Is something like this available? Actually, it is just about that simple. You can do that with software such as SharpCap. You can save subs as you observe with it. 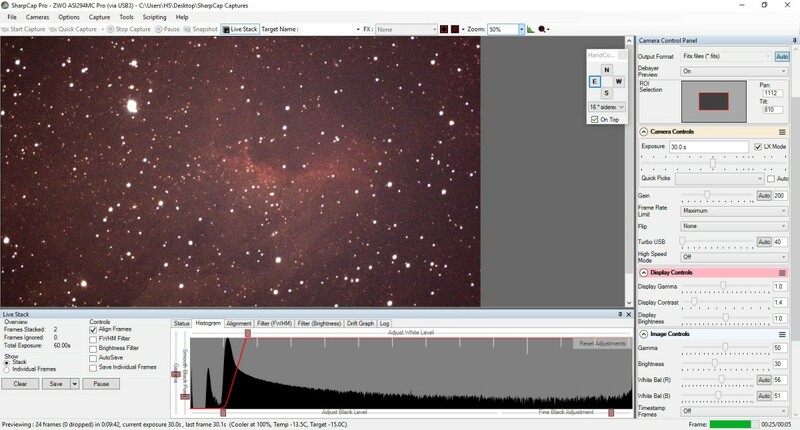 You can also use a fairly typical bit of software for image acquisition and set up AstroToaster to do some additional processing for the NRTV. I've gotta admit that if my priority is observing I often don't ever get around to actually processing the subs I acquire, but maybe I'll get do more of that in the future? just looked at this and my focus is off...dah.And I can not get sharpcap to align frames with 24mb files.so just stacked with my HDX110 mount and guided. Edited by mega256, 19 October 2017 - 12:17 PM. ZWO has published this neat comparison chart between the new 294pro and the existing ASI1600 color. Its a very useful chart and highlights the key differences with these two sensors. That well capacity is huge. Though I also find the 183 interesting, with its so tiny pixels. Means I don't need such a big scope to hit the max spatial resolution of seeing (or mount tracking). 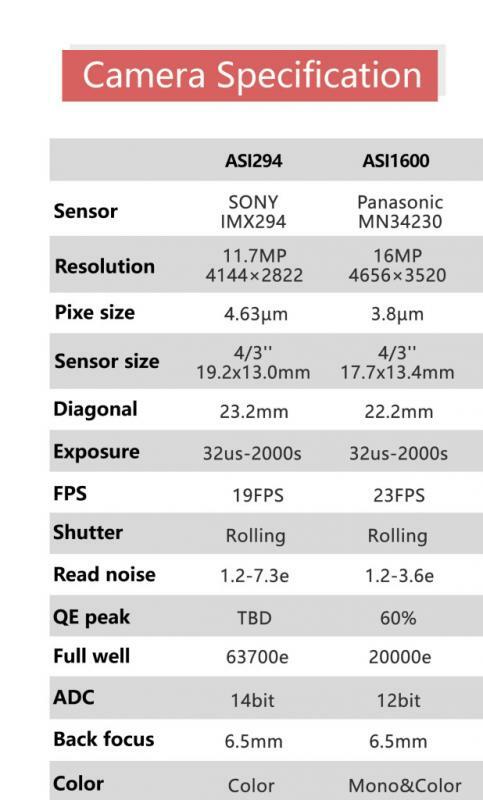 I am a novice at reading camera specs, would someone help me quantify if I have the essentials correct? The ASI 294 Pro has larger pixel size 4.63 vs. 3.8 of the 1600 which benefits EAA since larger pixels = more sensitivity? The ASI 294 Pro has potentially higher read noise (1.2-7.3 electrons) vs. the 1600's (1.2-3.6 electrons), this appears to be a detraction if I am reading this correctly.. The ASI 294 Pro has a higher well depth of 63.7ke vs. the 1600's 20ke, which translates to better dynamic range or SNR. The ASI 294 Pro has a higher ADC of 14 bit vs. the 1600's 12 bit, which translates to better accuracy of analogue to digital conversion? So with the exception of higher read noise, it would seem the ASI 294 Pro has significant improvements vs. the 1600. Is my summary reasonably accurate as a layman? If not what did I miss? Seems right to me, though the read noise is dependent on the gain you set, so you can control how much read noise you get, to some degree. There's other tradeoffs with gain, of course. However, keep in mind that bigger pixels isn't always better. Yes, you get more photons per pixel, but if you had twice as many pixels, while each pixel may be half as sensitive, you have twice as much data, and better spatial resolution. But, there's a limit to how much resolution is useful, given tracking accuracy and atmospheric conditions. Really, sensitivity is based on quantum efficiency (sometimes hard to get this number), and total surface area of the sensor. A 22mm diagonal sensor will simply have 4 times as many photons hit it as a 11mm sensor. Then the quantum efficiency governs how many of those photons get converted to electrons, and thus, data. Poor filters, bayer arrays, and microlens efficiency will all affect the net QE. In this case, both sensors are about the same size, so sensitivity difference will be based on the QE. Bigger pixels will have an advantage of easier processing and better for live viewing, so that could be important for people here. Unless your software does live software binning of pixels, in which case it wouldn't matter so much. The ASI 294 Pro has larger pixel size 4.63 vs. 3.8 of the 1600 which benefits EAA since larger pixels = more sensitivity? Yes and no - the benefits of larger physical pixels (reduces shot noise) can also be achieved via software binning if read noise is low enough. What matters more is Quantum Efficiency (QE) i.e. how many photons get converted to electrical signal or get detected. The 294 Color has higher QE than the 1600 color. The ASI 294 Pro has potentially higher read noise (1.2-7.3 electrons) vs. the 1600's (1.2-3.6 electrons), this appears to be a detraction if I am reading this correctly. Actually 294 achieves almost 13 stops of dynamic range at just 1.5e of read noise whereas the 1600 will provide less than 10 stops. 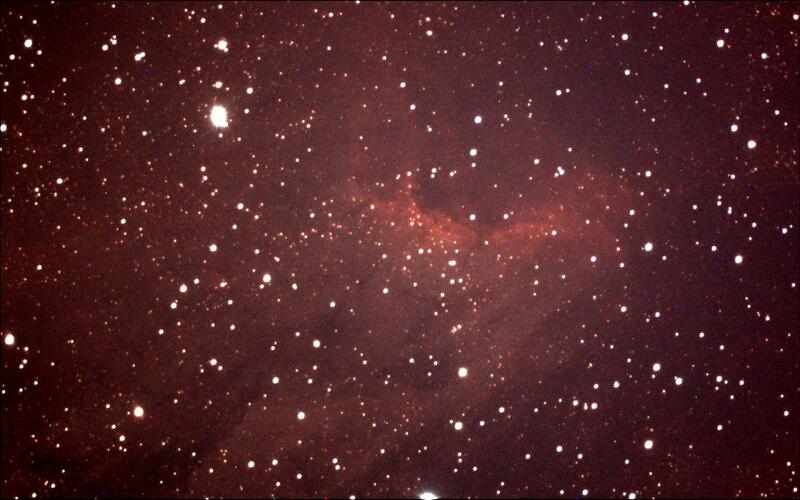 This is not relevant for shorter exposures at high gain but for long exposure astrophotography it matters. The ASI 294 Pro has a higher ADC of 14 bit vs. the 1600's 12 bit, which translates to better accuracy of analogue to digital conversion? No, not necessarily. Because the cameras have variable gain you can extract every last bit of signal by using higher gain than is possible with higher read noise cameras (a side benefit is that you will need to use shorter exposures which can also reduce mount and tracking accuracy requirements and make imaging / EAA a lot less painful). So with the exception of higher read noise, it would seem the ASI 294 Pro has significant improvements vs. the 1600. Is my summary reasonably accurate as a layman? If not what did I miss? Did not miss anything... Read noise is a red herring here. The 294 is unique in that at even such low read noise such a huge portion of the electron well is usable. Some more captures from last night. I wanted to try x1 binning which I have not been able to try because my Compute stick's limited processing capability cannot handle the full frame from the sensor - one of the downsides of such high resolution. So last night I defined a ROI - region of interest to crop the sensor and go after slightly smaller targets where using the full frame wastes storage and processing capability anyways and x1 binning provides better resolution. In summary the results were very good. Still seeing hot pixels but they don't bother me that much for EAA although you always want to make sure you are getting a good camera. Edited by Astrojedi, 19 October 2017 - 05:22 PM. 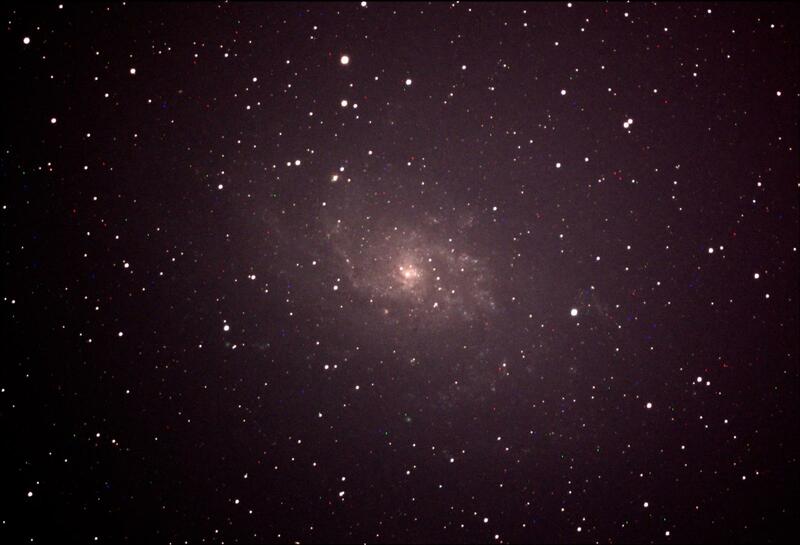 M33 9x30s - for some reason improvement was very minor after 3-4 subs - I am guessing due to poor transparency as this object was much closer to the horizon when I observed it. Sigh. I miss my Hyperstar. So tempting to dump my funds into an 8" EdgeHD, reducer, and Hyperstar. But then I'd have nothing left for a camera! Edit: Or a more stable mount. Edited by Robert York, 19 October 2017 - 08:06 PM. But seriously, this camera look super interesting. For a person who sets up at different locations, will this camera be of value? Edited by Astrojedi, 19 October 2017 - 11:50 PM.